Prepared on Notepad by Ian Smith, This page created 2nd April 2015. Best on 800*600. 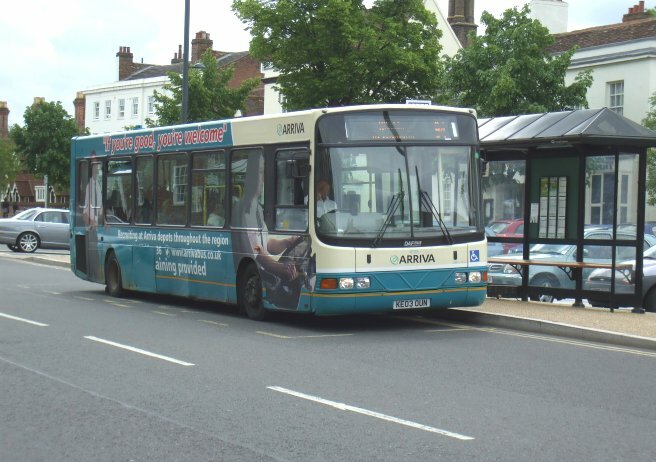 Arriva East Herts & Essex ordered eleven 10.2m Cadets (4500-4510) and three 9.4m Cadets (4511-4513). 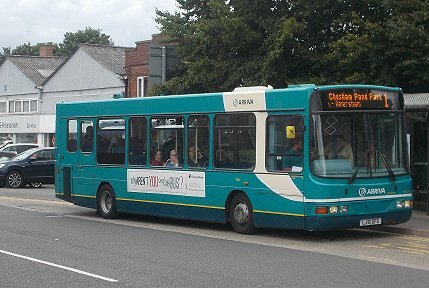 They were all dual doorway buses, dressed in Arriva's turquoise and cream national livery. The 10.2m buses were for the 256, the 9.4m buses for the 346. They started to arrive at Grays in November 2001, all being there by January 2002. At that point the Grays operations changed hands, coming under Arriva Southern Counties control. The only difference this made to the buses was to the legal lettering. Two of the buses, 4510 and 4512, had to be reregistered in the spring of 2002, when it was realised that the registrations they had did not match their VIN numbers. 4512 had to be done twice, with 4510 then getting its temporary registration and 4512 taking 4510's original mark. With Grays being an isolated pocket of the Arriva empire - as it had been in London Transport and London Country days - the batches stayed put, staying mainly on the pair of routes where they were supposed to be, with occasional forays on the 370 to Romford. 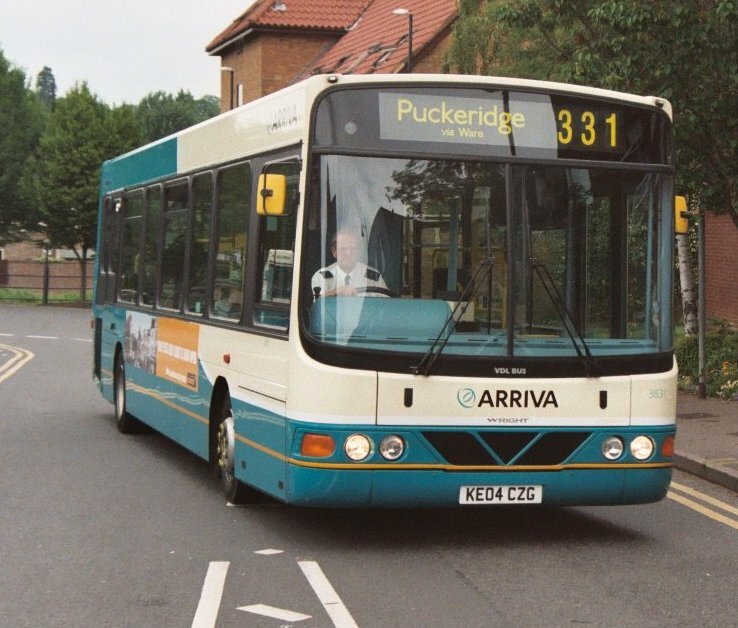 Arriva Southern Counties renumbered them in May 2005, making them 3500-3513, at the start of ASC's main Cadet block. Their routes being subject to tender rules by Transport for London, the tightening red conditions applied, and they succumbed in 2006 to the all-red regime. They mostly put in their ten years on the two routes, but in 2012 they were progressively taken into store and converted to single-doorway. (3510 had succumbed to an engine fire in 2010). They were repainted to interurban blue/blue. 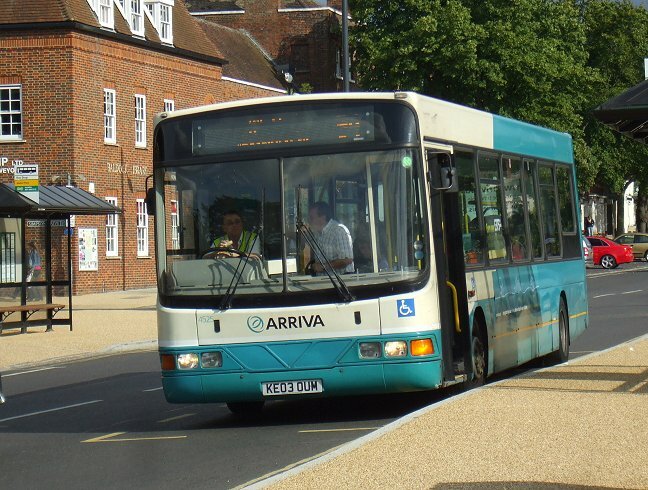 The 10.2m buses were transferred within Arriva Southern Counties to Southend. The 9.4m trio were transferred to Arriva the Shires at Milton Keynes. 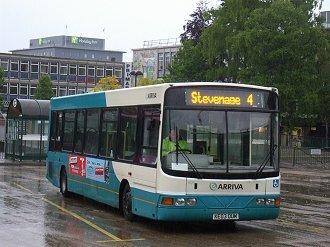 Arriva the Shires proceeded to take Cadets in penny numbers during 2002-3, for specific duties. 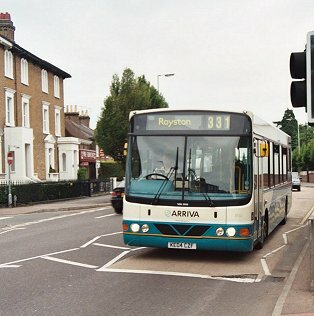 Three short 9.4m 35 seaters with single doorways arrived in February 2002, 4514 and 4515 for Garstons route W9 (Watford - Bushey - Little Bushey - Bushey Heath - Elstree - Borehamwood), and 4516 for Stevenage's cross-country rural route 44 to Luton. 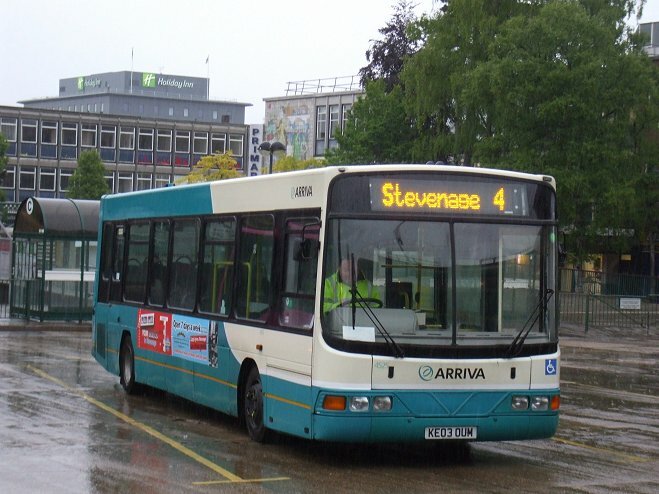 Stevenage acquired 4517 and 4518 in September 2002, the former a long 10.8m 39-seater for route 390 (Stevenage - Watton - Hertford), and the latter a medium-length 10.2m. 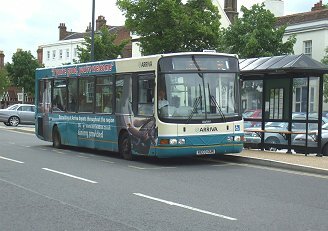 April 2003 saw the other seven arrive: 4519, 4520 and 4525 were another three 10.8m buses for Hitchin, where they took over from midibuses on the 90, 91, and 92. 4525 in the wet at Stevenage, on local 4, in June 2009. On a sunnier day a month later, 4525 at Baldock, on the rural route from Hitchin. 4521 and 4522 were short 9.4m buses for Ware, ostensibly for the Cheshunt routes C1, C2 and C3. 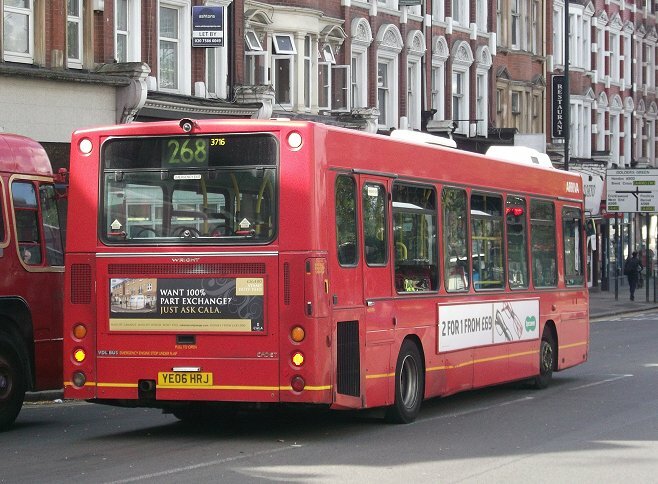 They soon began to appear on other routes, such as the 327, and then infrequently but fairly regularly on the Green Line 724, substituting for the ailing DAF SB220s. 4519 at Baldock, June 2010, wearing a driver recruitment ad. 4521 pulls in to Hertford Bus Station when still new in June 2003. 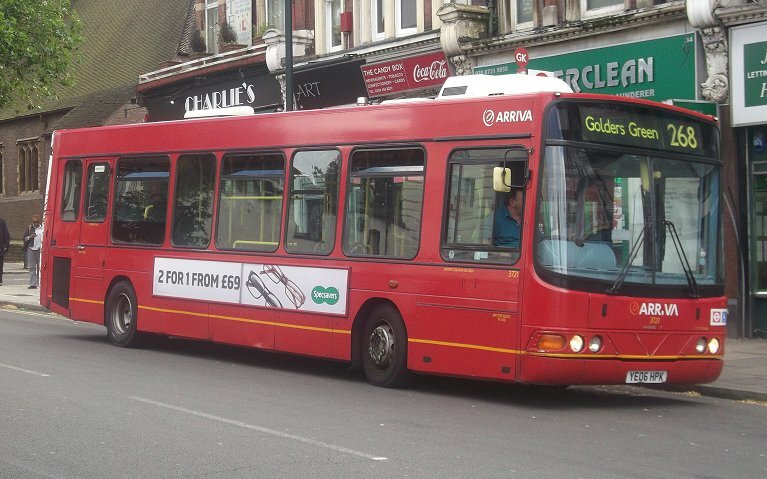 4523 and 4524 were long 10.8m buses, ostensibly for Hemel Hempstead's 10, 13 and 14. They very quickly became the regulars on route 52. 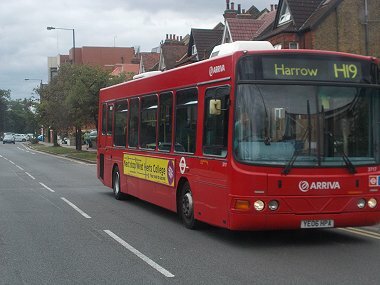 These buses have largely stayed where they were intended, at Garston, Hemel Hempstead and Ware. 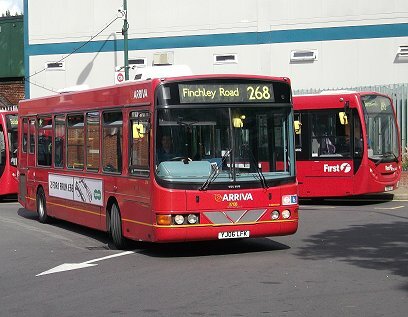 The Hitchin buses moved to Stevenage when Hitchin closed in January 2007, then they, and the Stevenage residents, moved across to Wycombe in 2012/3. Most have latterly acquired digital displays, and some gained interurban blue in 2012-3. 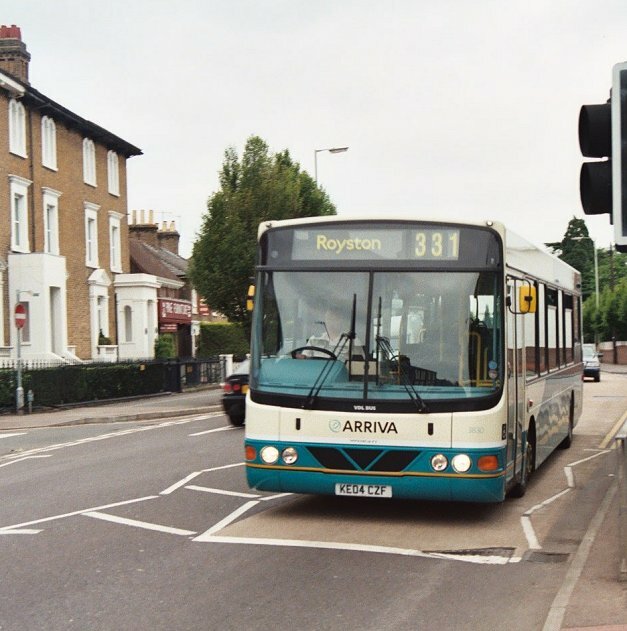 Three more 10.2m long Cadets arrived in March 2004 for the long 331 route (Hertford - Ware - Puckeridge - Royston). For once, the new buses actually stayed on the assigned route, although they did act as stand-ins on the 724 (Harlow - Hertford - Watford - Heathrow) on a far too frequent basis. On route in June 2004: 3830 enters Hertford before setting out to Royston on the 331. 3831 leaves the bus station bound for Puckeridge. Three long 10.8m Cadets arrived in August 2005 for the Cressex Park & Ride route 100, operated on behalf of local councils. It ran between the Cressex Parking site and High Wycombe Town Centre, taking in the Hospital, University and Railway Station. They were dressed in a distinctive lime green livery overall, with branding designed by Best Impressions. (right upper), with a large Park & Ride logo, plus other wording. Although delivered with three-track roller blinds, they were fitted with LED screens before service started in September. They did not stray often. The livery was amended at some point, with smaller logos. The route number became PR1. 3703 was repainted into interurban blue/blue in 2011, while 3701 and 3702 were repainted in the newer green livery in January 2014. 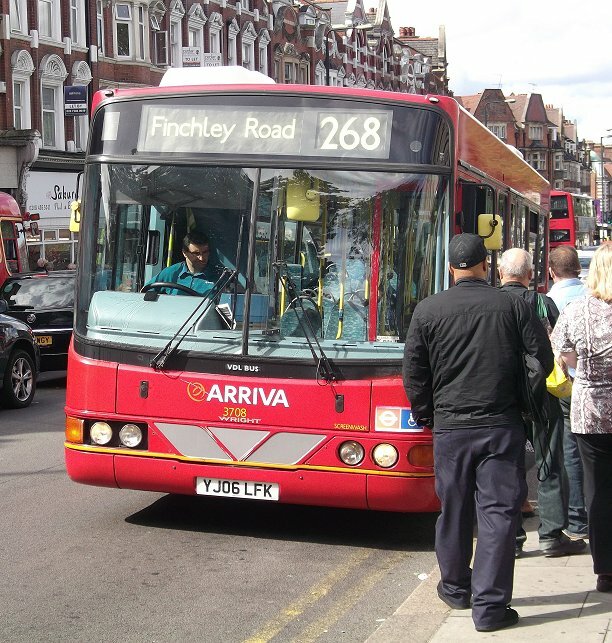 Arriva won the TfL contracts for the 268, H1 H2 and H3 in June 2006, so bought seven Cadets, 3704-3710, plus five Solos, the latter just for the H routes. The Cadets were 10.2m medium length buses with dual doorways - in London red with a deep yellow stripe. They had various white appendages on the roof for air-conditioning the driver. They were based at Garston. 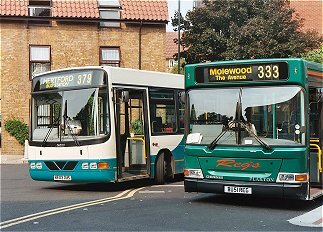 September saw another three routes- the 288, 303 and 305, for which a further eighteen red dual doorway buses (3711-3728) were acquired. Although in the Edgware area these too were operated from Garston. Later the Cadets appeared on the H18/H19 Harrow Circular routes. Golders Green on the 268 in September 2012: 3721 and 3716. The rear view shows additional and enlarged ventilation grilles. These Cadets were not an unalloyed success. They suffered from engine overheating, presumably due to the stop-start nature of inner suburban working, with close stops nearly all requiring the bus to stop and start. This situation was helped by modifications to the ventilation of the engine compartment. 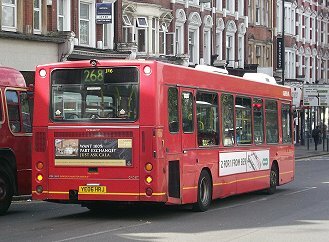 As well as their assigned routes, the Cadets also occasionally appeared on the double-decker TfL routes, the 142, 258 and 340. For these they had to use improvised blinds. The number of instances increased so much that in spring 2009 they were fitted with new blind sets that included these routes. The number of recorded instances of Cadets on these routes then fell, as other buses became available. 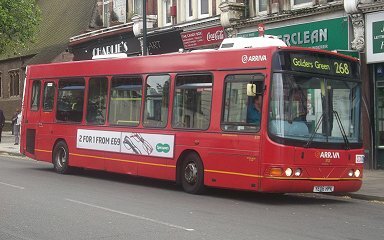 Although Arriva the Shires' "country" Cadets acquired digital displays, the red ones did not, the TfL contracts requiring the use of "paper" blinds. The whole batch was refurbished during 2013 (by Hants & Dorset at Eastleigh). 3717 on the H19, Harrow, 1st August 2012. 3708 heads out from Golders Green Station and loads up for a 268 to Finchley Road: September 2012. The original Cadet came on loan to Garston in June 2008 for the H18/H19, but soon returned to Dartford. In July 2009 it came again on loan, before returning for its finale with Southern Counties at Horsham. 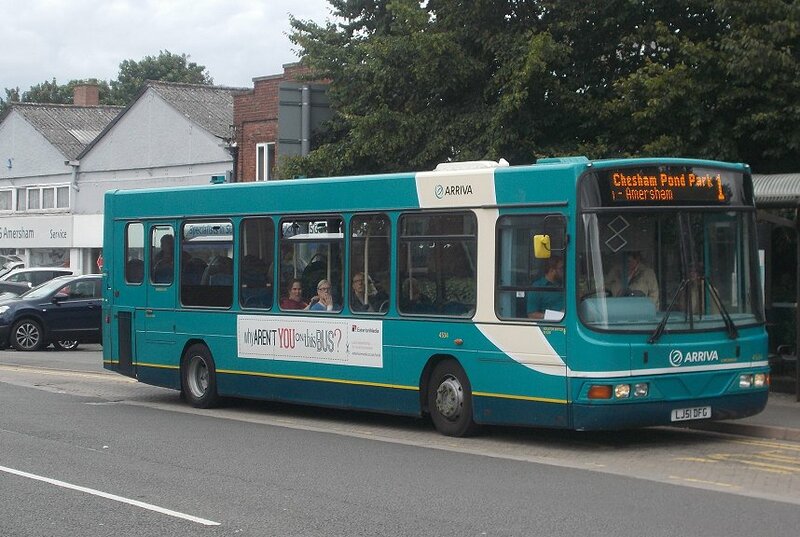 Two red Cadets came to Garston from Arriva Southern Counties on loan, 3515 in September 2012, and 3525 in July 2014. Both stayed long enough to become permanent fixtures in the Garston red two-door fleet. 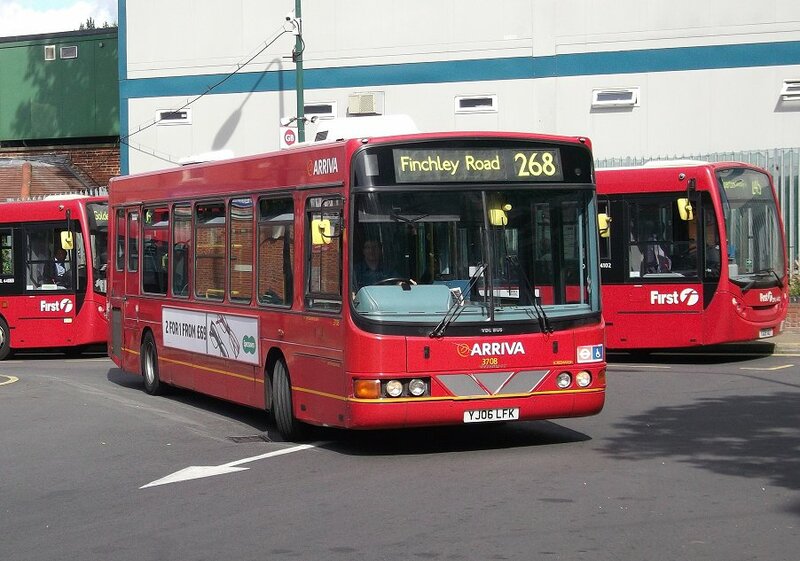 Both had originated as Arriva London 10.2m DWLs, before dispersal to Arriva Southern Counties for their TfL work. Arriva London sent twelve of their redundant 10.2m Cadets to Arriva the Shires. Before despatch they were converted to single doorway, upseated, and painted in Arriva interurban blue/blue/cream horn. 4529-4532 went initially to Wycombe; 4527, 4533 and 4534 to Hemel Hempstead; and the other five to Garston for "country" services. 4534 on 1 outside the old Amersham Garage, 1st August 2015. Bus Stop Cadet index. Arriva London DWL, DWS. bus histories. photo refs.